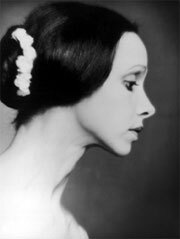 Eva Evdokimova was the most international ballerina of her time. She studied with the leading teachers in the West and in the Soviet Union, and was schooled both in the Western style, as exemplified by the Royal Ballet of London and the Royal Danish Ballet, as well as in the wider, more expressive style perfected by Agrippina Vaganova at the Kirov Ballet in Leningrad and continued by her pupil Vera Volkova, with whom Ms. Evdokimova worked intensively in Copenhagen. She is the meeting point of the Italian, French, Russian and English schools, and is the most comprehensively trained ballerina of modern times. Eva Evdokimova, born in Geneva, Switzerland, of an American mother and American-Bulgarian father, began her dance studies at the age of six at the school of the Munich State Opera. She continued at the Royal Ballet School in London, simultaneously studying piano and clarinet at the Guildhall School of Music. After additional studies with Maria Fay in London, she began her professional career by joining the Royal Danish Ballet, the first female foreigner to do so. Three years later she moved on to the Ballet of the Deutsche Oper, Berlin, where she was very soon promoted to Prima Ballerina. Dancing all the major 19th century classics as well as 20th century neoclassical and dramatic works, a repertoire of over 130 works, she won particular I international acclaim for her portrayals of Giselle and La Sylphide. For fifteen years Rudolf Nureyev became one of her most frequent partners. He chose her to dance many of his full-length productions throughout the world. Their partnership is legendary. The Berlin Senate awarded her the title of Prima Ballerina Assoluta. In New York City she has pursued her interest in acting, appearing in a number of theatre productions. She has performed specially created contemporary dances and has been teaching ballet in NYC, nationally and abroad. In addition she has presided over the jury of international competitions (Varna and Budapest Nureyev competition 1994, 1996, 1998 and Sapporo, Japan in 2003, 2004) and has staged classical productions.